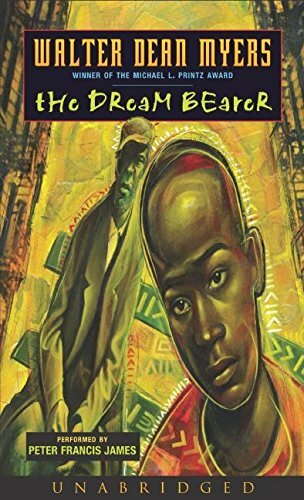 Review of "The Dream Bearer"
The Dream Bearer by Walter Dean Myers is a colorful novel about a boy learning to cope with his father's mental illness and the adult world around him. The story is set in Harlem. David Curry is the 12-year old African-American protagonist. His life is not easy. His mother is the primary wage earner. She wants to convert a neighborhood building into a homeless shelter. His father is on medication to control his mental illness, but frequently goes off it. He is only able to work as a day laborer, and unfortunately is employed by the owner of the building his wife wants to convert. His brother, 17-year old Tyrone, is involved with something unsavory. David thinks that it might be drugs but is not sure. Whatever it is, it has Tyrone on the run. Sessi Mutu is David's African friend and neighbor. She is building a traditional African hut on the roof of her tenement. Her parents have applied for American citizenship, but Sessi and David are both worried what will happen if their application is rejected? There is only David's childhood friend, Loren, to talk to about his worries until he meets a homeless man named Littlejohn Moses. Mr. Moses tells David that he is a "dream bearer". After living 300 years, Mr. Moses is tired and is looking for another person to be the new "dream bearer". As tensions grow at home between his mother and father and his brother does not returned home, David find comfort and insight in the dreams that Mr. Moses shares with David. The novel presents a colorful tableau of the urban world of Harlem. Parents struggle to get by in the world. Young men get involve with gangs, drugs, and gambling. African immigrants struggle to become American citizens, yet are reluctant to give up their native ways and customers. Homeless people sit on benches in the park. Boys grow up. This is an eye-opening book for anyone who does not live in an urban environment. Walter Dean Myers is the author of more than 75 books for young people. Myers was born in West Virginia but raised in Harlem. His autobiography which was written for young people is entitled, Bad Boy: a Memoir (2002). He has received many awards, including National Endowment of the Arts grant (1982 & 1989); the MacDowell Fellowship (1988); American Library Association (ALA) Margaret A. Edwards Award for Lifetime Achievement in Writing for Young Adults (1994), and ALAN Award (1994). Many of his books have received awards including, Where Does the Day Go? (1968 Council on Interracial Books for Children Award); The Dancers (1972 Child Study Association of America's Children's Books of the Year); Fast Sam, Cool Clyde and Stuff (1975 ALA Notable Children's Books List); Ain't All for Nothin' (1978 ALA Notable Children's Books List, 1978 ALA Best Books For Young Adults List); The Young Landlords (1980 Coretta Scott King Award, 1979 ALA Notable Children's Books List, 1979 ALA Best Books For Young Adults List); Legend of Tarik (1982 Notable Children's Trade Book in the Field of Social Studies from the National Council for Social Studies and the Children's Book Council, 1981 ALA Notable Children's Books List,1981 ALA Best Books For Young Adults List); Hoops (1994 Margaret A. Edwards Award, 1982 Edgar Allan Poe Award runner-up, 1982 ALA Notable Children's Books List, 1982 ALA Best Books For Young Adults List); Won't Know Til' I Get There (1982 Parents' Choice Foundation Award); Tales of a Dead King (1983 New Jersey Institute Technology Authors Award); The Outside Shot (1984 Parents' Choice Foundation Award); Motown (1985 Coretta Scott King Award); Didi (1985 Coretta Scott King Award); Adventure in Granada (1987 Child Study Association of America's Children's Books of the Year); Fallen Angels (1989 Coretta Scott King Award, 1988 Parents' Choice Foundation Award, 1988 ALA Best Books For Young Adults List); Me, Mop, and the Moondance Kid (1988 ALA Notable Children's Books List); Scorpions (1989 Newbery Honor Book, 1988 ALA Notable Children's Books List, 1988 ALA Best Books For Young Adults List); Now Is Your Time (1992 Coretta Scott King Award,1992 ALA Best Books For Young Adults List); Somewhere in the Darkness (1993 Newbery Honor Book, 1993 Coretta Scott King Award,1993 ALA Notable Children's Books List, 1993 ALA Best Books For Young Adults List,1992 Boston Globe/Horn Book Award,); Malcolm X (1994 Coretta Scott King Award); Slam! 1997 Coretta Scott King Award; Harlem (1998 Caldecott Honor Book, 1998 Coretta Scott King Award, 1998 ALA Best Books For Young Adults List); and Monster (1999 Michael L. Printz Award, 1999 Coretta Scott King Author Honor Award, and 1998 National Book Award Finalist). Mr. Myers lives in New Jersey with his family. Shooter (2004) is his latest novel. The Dream Bearer by Walter Dean Myers is a well written novel. The book is recommended for Age 10 years and up. I recommend this book.